Born in London in 1838, he was the pupil of his father F.W. Topham. After studying with his father he enrolled at the Royal Academy schools to further his art training. In the late 1850s he traveled to Paris to study with Gleyre – where he learned the techniques of the French Salon painters. By 1860 he and his father were in Ireland and in 1863 & 1865 he was traveling through Italy – basing himself in Ravenna – with E.S. Lundgren and F. Dillon. Throughout these journeys, he produced numerous watercolor and oil studies. In 1876 both father and son sent works to the Philadelphia Exhibition, and a year later, while traveling through Spain his father died; Francis returned to London. 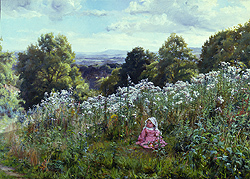 In 1879 he was elected a member of the Royal Institute of Painters in Watercolour and in 1883 became a member of the Royal Society of Painters in Oil-Colors. 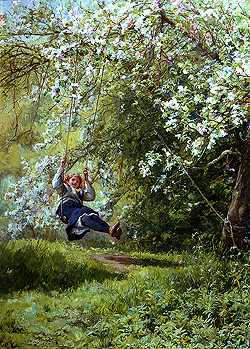 Topham’s style and subject matter are typical of the late Victorian artists – painting beautiful genre and landscapes in a colorful, slightly impressionistic, style. Among the halls he chose to exhibit at were the: Paris Salon, Royal Academy, Royal Institute and the Royal Society of Painters in Oil-Colours.